There's no better example of this than the city of Las Vegas, Nevada -- a city of 600,000 people who almost universally depend on one lake for their water. And that lake is running dry at an alarming rate, after which there will be no more water for Las Vegas. The lake is called Lake Mead, created by the Hoover Dam. Back in 1936, when the Las Vegas population was very tiny by today's standards, Lake Mead took six years to fill with water. Now, with over two million people in the greater Vegas region depending on its water, Lake Mead has dropped by 50% and is receding with alarming speed. The situation is as bad as you can imagine. It's just going to be screwed. And relatively quickly. Unless it can find a way to get more water from somewhere Las Vegas is out of business. Yet they're still building, which is stupid. Ah, but "stupid" is popular, you see. Delusional thinking is embedded into the American culture at every level: medicine, finance, security, fossil fuels, the food supply and more. After all, only delusional thinking would allow continued real estate development in a city with no future water supply, yet it continues to this very day in Las Vegas. The drought is like a slow spreading cancer across the desert. It's not like a tornado or a tsunami, bang. The effects are playing out over decades. And as the water situation becomes more dire we are going to start having to talk about the removal of people (from Las Vegas). Mrowka, like anyone who applies rational thinking to the problems facing America today, will of course be aggressively ridiculed and condemned by the delusional-weavers. The greatest sin to commit in a society steeped in delusional thinking is to tell the truth about where things are headed. That's not something people want to hear, especially when the all the fountains at the Bellagio are so pretty. Las Vegas currently uses 219 gallons of water per person, per day -- one of the highest figures in the nation. That this is taking place in a desert is extreme stupidity, and it proves the point of this article: humanity is shortsighted and living in a delusional fantasy where people think they never have to deal with the long-term effects of present-day actions. Attempts to resolve this water shortage problem are themselves steeped in stupidity and desperation: Vegas is trying to build a desperate water pipeline by spending over $15 billion to pipe in billions of gallons of water from another water source 260 miles away, but this project has been halted by the courts due to environmental concerns. Even if the pipeline were built, it only delays the inevitable. Building a city in the desert and importing the water supply simply isn't sustainable because there's just not enough rainwater nearby to go around. Duh. Truth be told, much of the Western USA is in the same dire situation as Las Vegas. Cities like Los Angeles were founded in the desert, then artificially supplied with water that's literally pumped over a mountain. If those pumps are halted for any reason, Las Vegas immediately reverts to a desert, and the city becomes a death trap for its millions of residents who rapidly discover they are living in a desert. Even when the water is pumping, the entire state of California -- yes, 100 percent -- has already been classified as being in a state of "severe drought." Imagine what this looks like without the imported water. Phoenix is also a city that's too large for its water supply. Nearby Tucson suffers much the same problem. Nevada, California, Arizona, New Mexico and Utah are all wildly unsustainable in terms of water supplies. They all depend in part on the Colorado River, but that River is also headed for imminent collapse. Every large city in an orange or red portion of this map is headed for collapse. This covers the majority of the Western half of the nation. Refuge areas will be those with plentiful rainfall such as the Pacific Northwest and regions far East of the Rockies. This is why so many people are already headed to Central Texas, by the way. 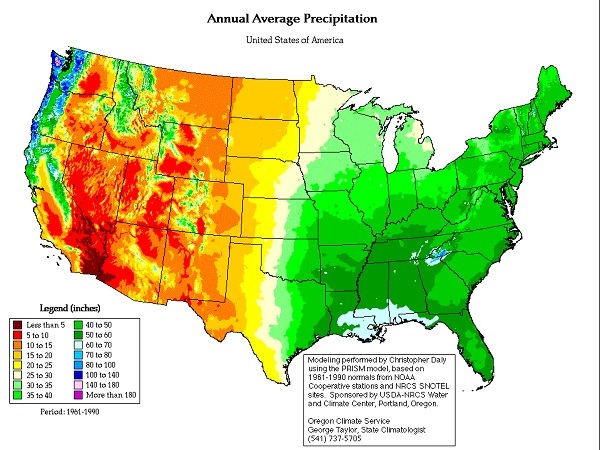 If you look at Texas, you'll notice it's clearly divided in terms of rainfall. Austin is roughly the dividing line, and everything West of Austin is bone dry, with little or no topsoil. East of Austin, you start to get precipitation which rapidly accelerates as you head toward Houston or East Texas, where patent trolls live in mucky swamplands and file lawsuits against technology companies. This map might as well be called the "American migration map of 2050," because it shows where people will be forced to evacuate (areas in RED) and where they will be headed (areas in GREEN). Of course, anyone who dares point out this obvious fact in the USA is immediately branded a "conspiracy theorist" or a "doomsday pessimist." The politically correct stance on all this in America today is to live in the proper state of delusional denial that's socially acceptable. Never mind the fact that these large U.S. cities -- Los Angeles, Phoenix, Salt Lake City, San Diego and more -- will collapse into ghost towns long before the year 2100. Yet we are told, instead, to worry about global warming because it might raise the sea level by two inches over that period of time. 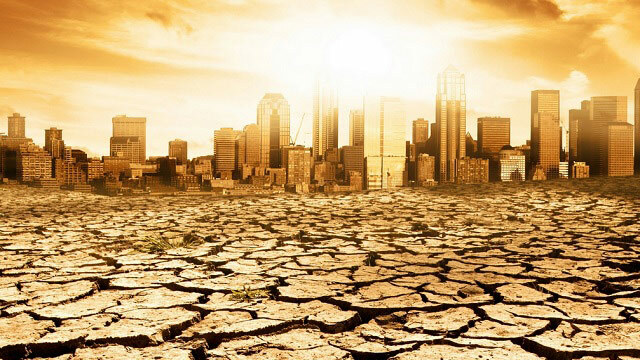 Global warming is the "popular fear" of the day, you see, but the truth about the dwindling water supply of cities like Los Angeles is simply imagined away as if the problem didn't exist at all. Ironically, the most likely attempts to solve the water crisis will involve worsening global warming by burning coal to run energy-intensive desalination plants that produce fresh water. There's plenty of water to go around, after all, if you can just remove all the salt from it. But that process requires an enormous amount of energy at great expense. Desalinated water is so expensive that the mere act of washing your own car in your driveway might use $25 worth of water one day. Water is about to get very, very expensive across the South West, and that's if it exists at all. Even solar-powered desalination plants are extremely expensive to get off the ground. Although "clean" in their operation, solar panels are made with lead and other toxic heavy metals, and the electronics that drive these systems require rare earth metals mined in China. Even with renewable energy, it turns out, there is no "clean" way to get fresh water out of the ocean... not at any cost. Ultimately, Mr. Mrowka is the one who is correct: Present-day human populations are not sustainable in the South West. This is a mathematical certainty, and it leaves just two options: 1) Mass migrations away from the cities, or 2) Mass death. One way or another, the populations will have to come down or die of dehydration. In that sense, the problem is self-solving from a planetary perspective. Humans who are too stupid to live within the boundaries of geological resources will be evacuated or eliminated, one way or another. But you can also expect violence to erupt in this process as states or regions go to war over water rights. Water, after all, equals economic productivity in the context of agriculture, and he who controls the water reaps the benefit of crop production. You can fully expect to see violent conflicts over these water rights in the decades ahead as the American South West collapses back into its more natural desert-like state. Ultimately, Mother Earth wins all water wars. Humans who are too stupid to realize this will either be involuntarily relocated or removed from the gene pool.